Our routine for Halloween night is to have an easy supper of Baked Chicken Tacos. I can make the filling the night before so then it only takes 15 minutes to stuff the shells, warm them up, and melt the cheese. 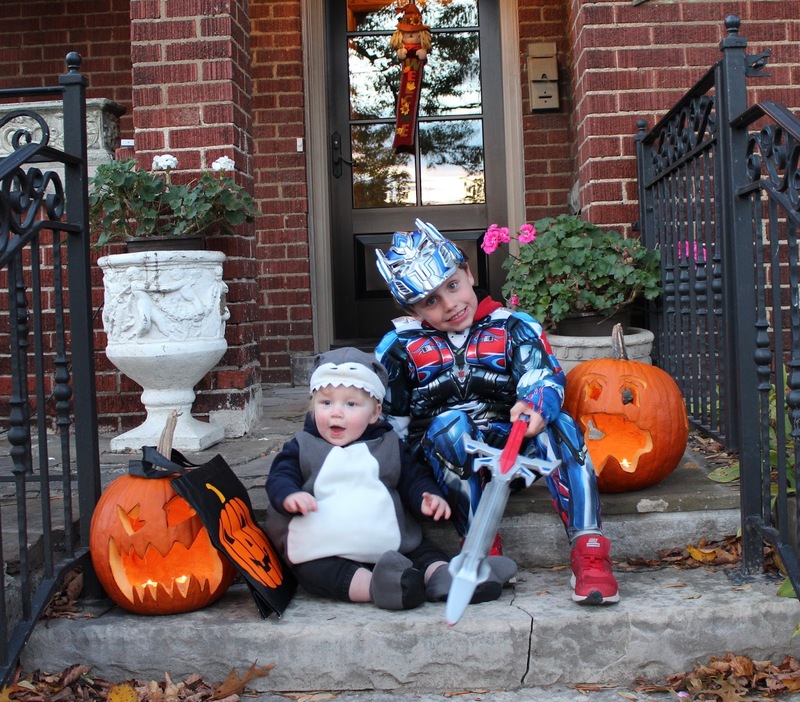 This year we were home by 5:15 so we ate supper, got E and Q back into their costumes, put out the pumpkins, took some photos, and then went trick or treating. 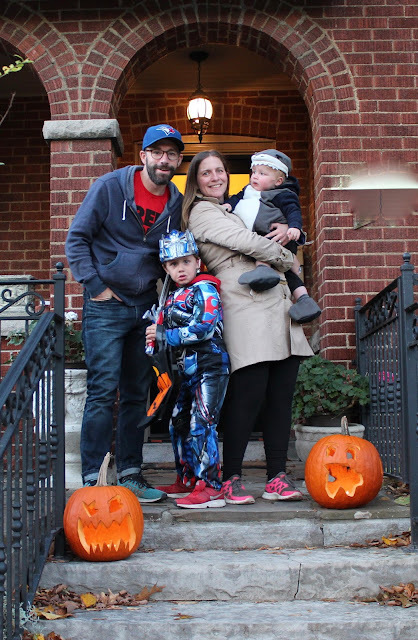 Q went to our immediate neighbours (5 houses in total) and then E and Dave took off to meet up with some friends and trick or treat the whole neighbourhood. Q was interested in the bowl of treats but aside from a few crumbs of Wunderbar, he didn't get any of those. He did enjoy some chips from the neighbours across the street. We had 36 kids total which is much less than we usually get and they completely stopped at 7:30 which was also earlier than normal. E had a great time out there with some friends and Dave. 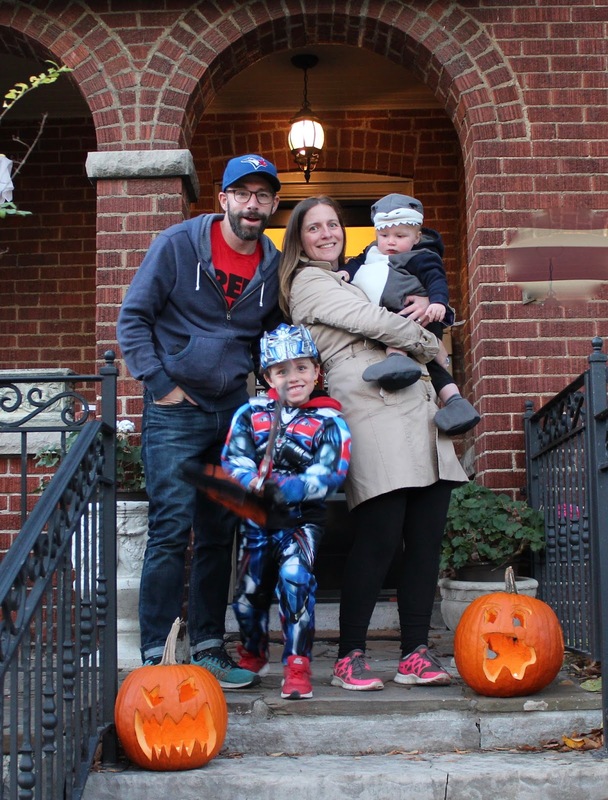 I dressed him in several layers under his costume and I don't think he stopped moving. He said "it's pretty hot out there" when he came back halfway through the evening to dump out his bag and grab a drink of water. A good haul, and he didn't mind sharing. Very cute! What a haul! And he even got an oak leaf! What a stash! Looks like a great halloween!